While browsing facebook last week, I saw Drew Estate had posted something regarding an event in my area, and the opportunity to get an unreleased cigar. I wasn't planning on making this event, but I couldn't turn down the opportunity to get my hands on something not available to the general public. So I went to the event, said the secret phrase to Erik Espinosa (of EO brands) and Marvin Samel, and was gifted a 6 1/4 x 46 "Ratzilla" prototype. Marvin asked me to share my thoughts on the cigar with him, so while I'm at it, I might as well post my first review here as well. 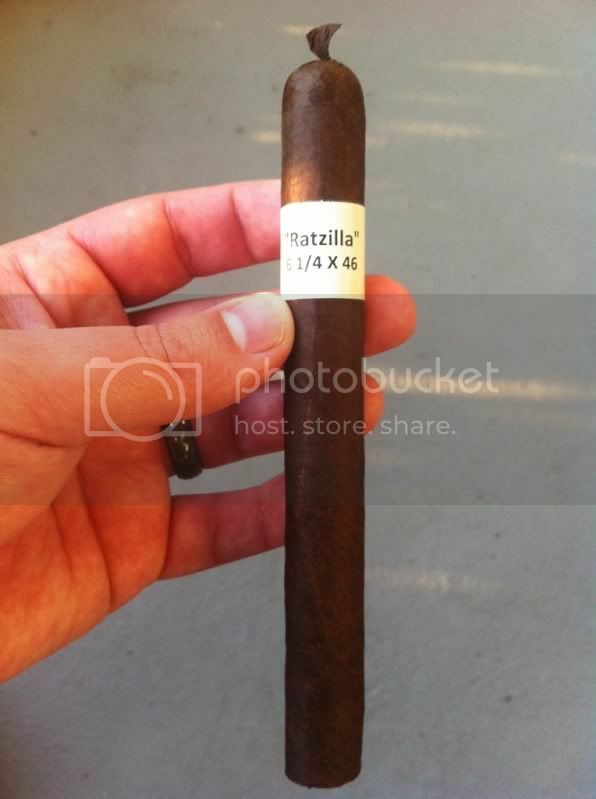 I'm going to preface this with the fact that I usually only keep notes for my own reference and my palate isn't quite as well tuned as others, but since this cigar isn't available yet, I thought I'd share my experience with you. This is a great looking cigar, wrapper is dark and oily, a little toothy, and it gives off a nice tabacco aroma. The cap is finished with a nice pigtail. Upon lighting the cigar, I'm welcomed with the familiar blast of pepper, the draw is light and airy, but I get plenty of smoke. The finish is full of pepper and stays on the palate for a while. An inch or so in, there is a little more earthy flavor creeping in, but still plenty of pepper on the finish. There a slight uneven burn that eventually required a few touchups, and the cigar produces a LOT of smoke, both from the draw and from the foot while resting. About halfway in, the pepper fades some and reveals some coffee and chocolate notes, but I still pick up pepper/spice on the finish. As I continue there are some woody flavors that I pick up every now and then in addition to the coffee and chocolate. Still some issues with the burn, had to make a few more touchups than I normally like. Into the last third of the cigar the pepper fades some and the woody flavors pick up a little. Have I mentioned this cigar puts of a LOT of smoke yet? Yeah? Well tons of smoke from the draw and the foot all throughout, but it never gets hot or bitter. With about 2 inches left, the pepper returns along with the sweet chocolate flavor. Overall, I found this to be a very enjoyable cigar, very similar to the Dirty Rat. The only thing that detracted from the experience were the burn issues, however I'm sure that the boys at Drew Estate will have those all ironed out by the time this cigar goes into full production. I'm looking forward to seeing how the Ratzilla changes between now and the release, and I hope to be able to pick up a box when they are available. Thanks for the review. I look forward to giving one of these a try myself! Nice review...glad to see the similarity between this and the dirty rat...can't wait for this to hit the market. Great review Brian! Thanks for sharing! wow my mouth drooled just looking at the pics and reading the review. Thanks. This is a smoke that I'm dying to try. "If I cannot smoke in heaven, then I shall not go." Nice review. Too bad I cant get my hands on one of these. Guess Ill have to wait till they become a regular release. Great pics and nice review. Another LP Coffee, Pepper, Chocolate bomb? Yes please!!! I've smoked a few of these in varying sizes over the period from last November up until now, and I would have to say that your description is pretty much what I get out of these too. 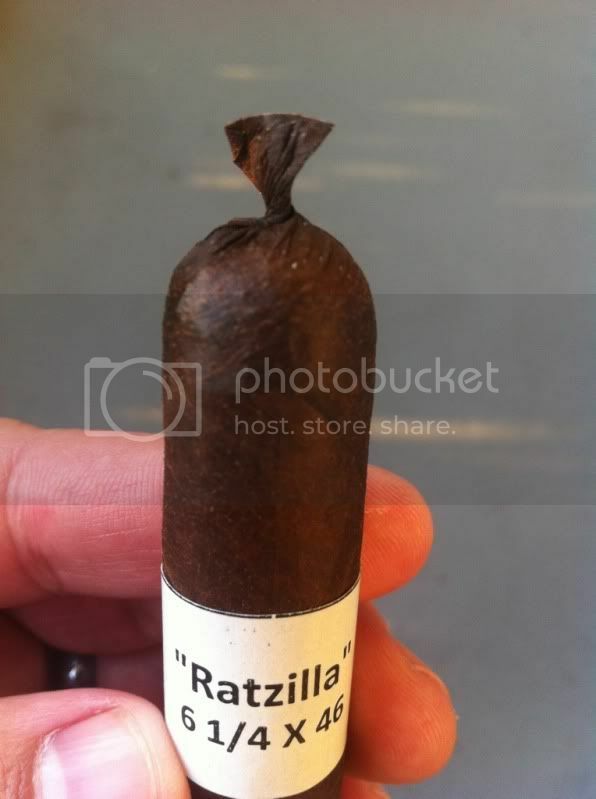 For anyone who ever wanted a longer smoking Dirty Rat that took a bit more time to develop, this cigar is it.